The Family Spa Cabins have a set of bunks situated in the spacious living area which separates with sliding doors from the queen bed in the bedroom. 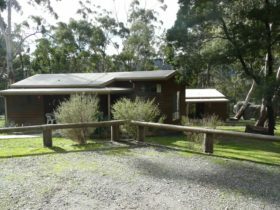 Featuring a large covered veranda and outdoor setting overlooking native bush lands. Linen supplied for all beds. Large open plan lounge and kitchenette featuring gas stove, microwave, fridge freezer, flat screen television and DVD player. 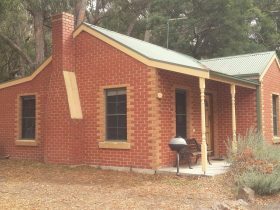 The Double Cottages are a one bedroom refurbished cabin with a comfortable, modern look and feel. They are ideal for couples wanting something a little special during their holiday or mini-break. Featuring a large covered veranda and outdoor setting, a double bed with linen and electric blanket supplied. Bathroom, open plan kitchenette with gas stove, microwave, bar fridge, flat screen television and DVD player. Reverse cycle air conditioning and heating. Comfortably sleeps two people. Use of all park facilities including free Wi-Fi, swimming pool, playground, jumping pillow and free barbecue areas. Selected dog friendly cabins on request, please call reception to find out availability. The Twin Deluxe Cabins are the most modern and spacious of our cabins, they are ideal for families people or two couples. Featuring a large covered veranda and outdoor setting for entertaining. Two bedrooms with one double in first room and one double with a single bunk on top in the second room. All linen is provided. Large open plan lounge and kitchenette featuring gas stove, microwave, fridge freezer, flat screen television and DVD player. Reverse cycle air conditioning and heating. This cabin comfortably sleeps five people. Use of all park facilities including free Wi-Fi, swimming pool, playground, jumping pillow, and free barbecue areas. Selected dog friendly cabins on request, please call reception to find out availability. The Deluxe five berth Cabins are spacious cabins and are ideal for families or groups. Featuring a large covered verandah and outdoor setting for entertaining. Two bedrooms with one double in first room and a bunk bed with a double and single bunk in the second room. All linen is supplied. Large open plan lounge and kitchenette featuring gas stove, microwave, fridge freezer, flat screen television and DVD player. Reverse cycle air conditioning/heating. This cabin comfortably sleeps five people. The Two Bedroom Family Budget Cabins are a two bedroom cabin with an older look and feel and most suited to price conscious families. Featuring a double bed in the main bedroom. In the second bedroom is a small triple bunk, suitable for children only. Other features include bathroom and kitchenette with electric stove, microwave, bar fridge, flat screen television and DVD player. Heating is by oil filled radiator and an air conditioner for cooling. Comfortably sleeps two adults and up to three children. The Twin Cabin has one bedroom with two single beds, supplied with linen and electric blankets. Refurbished cabin with a comfortable, modern look and feel. They are ideal for two people who don’t share a bed but don’t want to pay extra to get separate bedrooms while on their holiday. 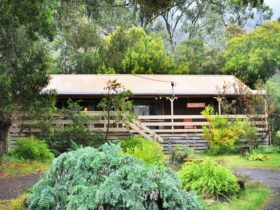 Featuring a large covered verandah and outdoor setting, Bathroom, open plan kitchenette with gas stove, microwave, bar fridge, flat screen television and DVD player. Reverse cycle air conditioning and heating. Sleeps two people comfortably. Use of all park facilities including free Wi-Fi, swimming pool, playground, jumping pillow and free barbecue areas. 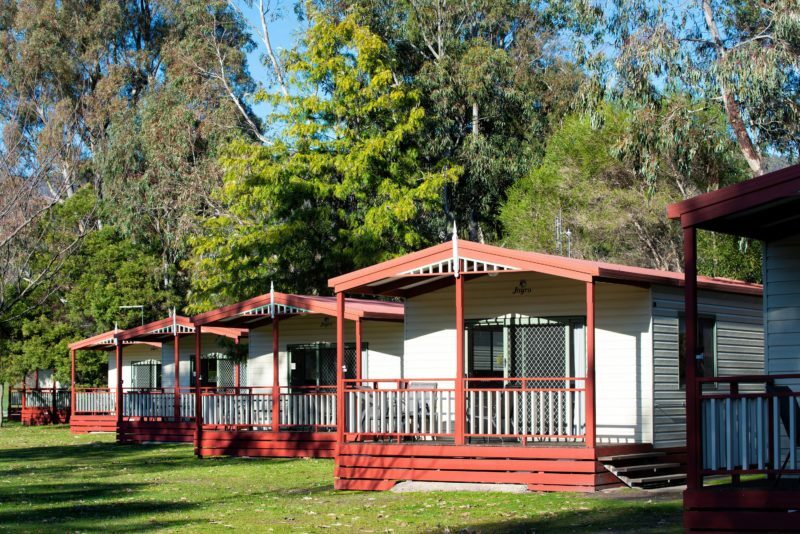 With 60 Powered Sites to choose from, Halls Gap Gardens Caravan Park hopes to cater for everyone’s needs. 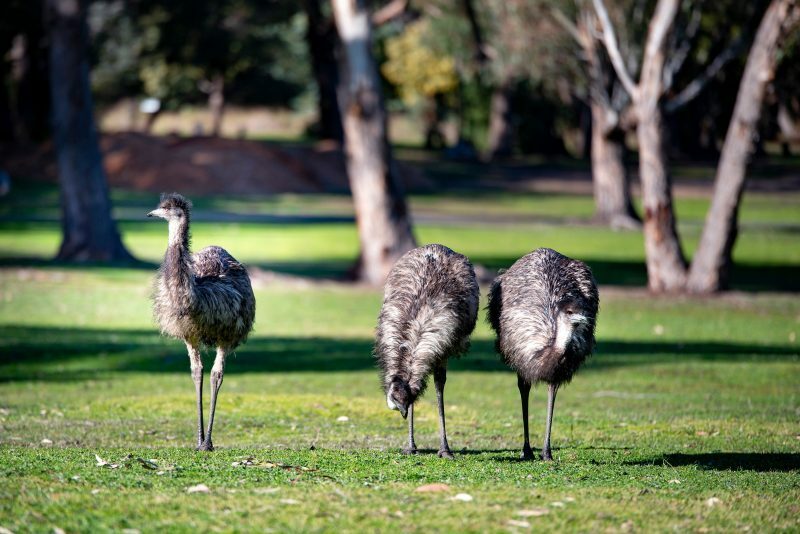 Choose from concrete slabs or grassed sites, with many shaded and set in native bush land surroundings. 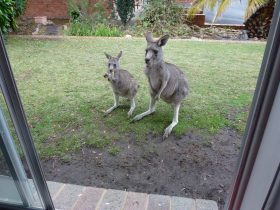 There are fire bins in common areas for guests to use (subject to availability and CFA restrictions) for when the sun goes down and the kangaroos come out to feed. All powered sites are close to park amenities, laundry and free barbecues or short stroll to the campers kitchen/television room and dining area. Free Wifi. Swimming pool, playground and jumping pillow onsite. Dogs welcome. 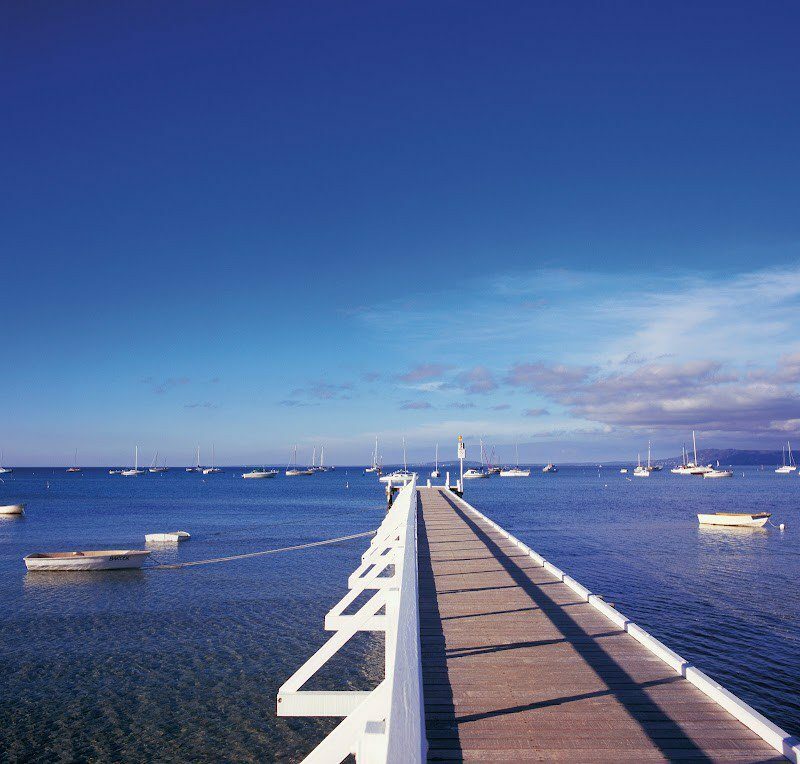 Choose from large shady grassed sites to open grassed areas with amazing views. 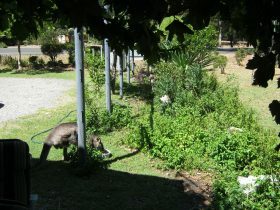 An abundance of wildlife graze in this area. With over 200 Unpowered Sites to choose from, the park can cater for everyone’s needs. Common area fireplace are located around the property. Some sites do have fixed fire drums. Use of all park facilities including free WIFI, swimming pool, playground, jumping pillow, camp kitchen and television room, Amenities blocks and free barbecue areas. Dogs welcome. 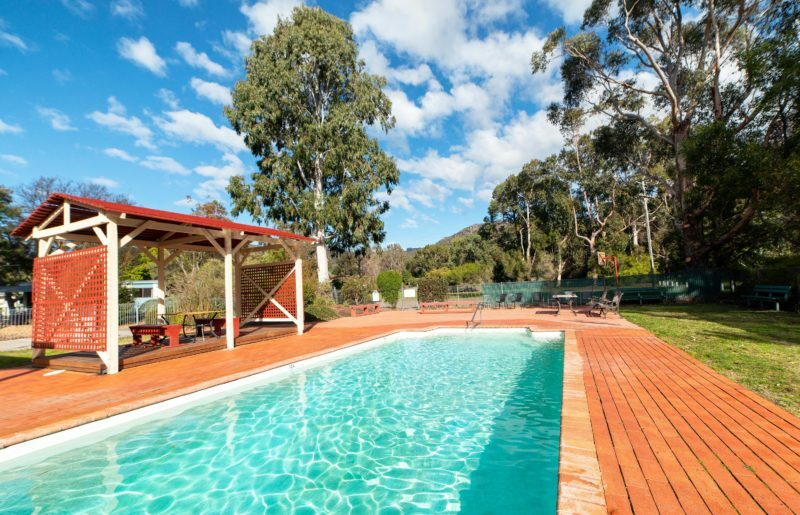 Camping sites from $30 for two people per night. Cabins ranging from $100 – $160 per night for two people.